Persijn Broersen and Margit Lukács’ artistic partnership questions the origins of contemporary visual culture. It is nothing new to say that film, mass media, and other forms of visual culture affect how we envision our surroundings and perceive the world. Nevertheless, postmodern attempts to denaturalize these perceptions often create interesting results. In their current solo show at Galerie Akinci, Broersen and Lukács take on the American wilderness with a play on Bambi. While the tragic 1942 children’s classic is surely not the unique source for contemporary images of an untouched American wilderness, it is clear that Disney does play a role in visually and experientially shaping our collective imagination (Epcot Center, anyone?). 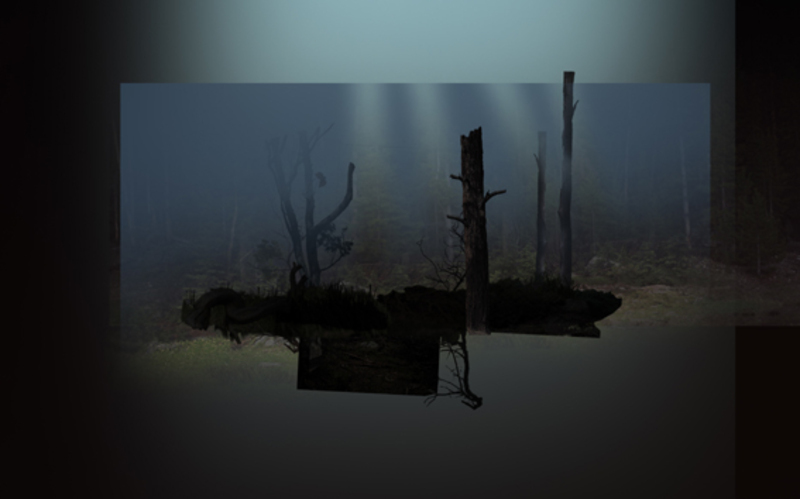 Yet, rather than exploring the much noted Disney-fication of culture and nation, Broersen and Lukács set their sites on the visual mediation of landscape, with a haunting film and a series of digital photo-collages. In Places We Know, the artists consider the aesthetic tropes of sheltered forest and sublime nature. These types of images are clearly connected to narratives of exploration and contact, setting up dichotomies of man versus nature, outsider versus native, and tame versus wild. Mastering Bambi is a film comprised entirely of scenery. The Disney classic is recognizable – if not specifically, then as one among many symbols of the sheltered forest at odds with a cruel human world. (The forest in Snow White predates and shares many characteristics with the Bambi forest, for example). The film presents a carefully constructed landscape through zooms, long panning shots, and shallow camera angles that create a sense of intimacy and privacy. An obscured plot is evoked by the camera movement plus a suggestive soundtrack in which twittering birds and cheerful choruses give way to frenzied strings and chatty clarinets. The artists use layers of real photographs to create a static and artificial environment through which their “camera” moves in and out, side to side. The scenery oscillates between the idyllic secluded forest, reinforced by harmonizing choruses, and terrifying winter plains (in which setting you’ll no doubt recall the death of Bambi’s mother). The panning camera settles on tree branches and forest clearings where we expect birds, squirrels, and cuddling woodland creatures. Instead these spaces are empty, devoid of figurative action: the backdrop takes center stage. Besides Mastering Bambi, Broersen and Lukács present a series of digital photo collages that overlay real images to create the pristine wilderness of the imagination. The collage technique, employing countless photographs, recalls the way our collective memory is pieced together from the real into the sur- or pseudo-real. The landscapes are not entirely false, yet the forms the composites take are highly mediated by painting and film. Indeed, these collages reference the work of German-American painter and Hudson School proponent Albert Bierstadt, whose epic landscape paintings projected the romance and mystery of a pure, unspoiled nature. Bierstadt’s iconic images of the American West are characterized by the primordial and sublime, often displaying a glowing light, which has come to be known as luminism. Similarly, Broersen and Lukács’ layered images lead the eye down mysterious backlit paths, seemingly asking you to enter this luminous (though not entirely safe) space of the wild. Places We Know highlights an untouched nature in a moment that could precede human contact. We view nature from the inside, as if we are an omniscient narrator or the all-knowing owl overseeing the naïve sylvan activities. The undetermined point-of-view is reminiscent of fly-on-the-wall documentary style, which is never as unobtrusive as we are lead to believe. These types of scenes (and the stories they tell) are so ingrained in the collective imagination that it would be impossible to directly pinpoint their origins. Bambi is but one source, one piece in the intertextual collage (to borrow from Umberto Ecco) of the fantasy. The serene West and the virgin forest are “places we know”, even though we obviously haven’t been there. This is the mastery of Bambi: the revelation that we play unwitting host to fiction. Perhaps more than Bambi’s heartrending plot and delightful characters, it is the film’s backdrop that stays with us the most, secretly burrowing deep into our consciousness where we no longer recognize it for the construct it is. It doesn’t exist, but it is a place we all know. ~Andrea Alessi, a writer from the Netherlands.